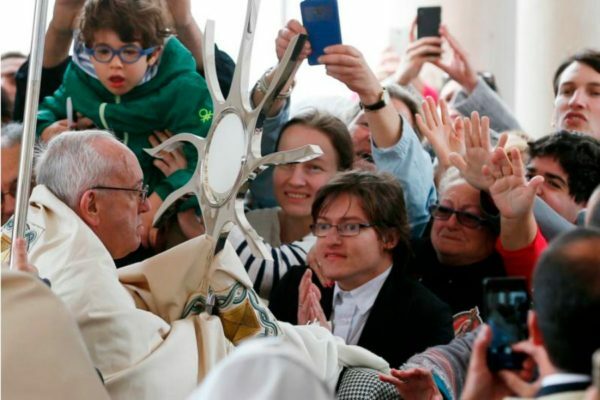 Pope Francis called on the pilgrims to follow the example of heroic virtue lived by St. Francisco and St. Jacinta, particularly their insistent prayer for sinners and their adoration of “the hidden Jesus” in the tabernacle. “We do not want to be a stillborn hope! Life can survive only because of the generosity of other lives,” he said. It is with the light of hope, the pope added, that the church can radiate “the true face of Jesus” and reach out to those in need. “Thus, may we rediscover the young and beautiful face of the church, which shines forth when she is missionary, welcoming, free, faithful, poor in means and rich in love,” he said. Addressing the sick before concluding the Mass, Pope Francis said that Christ understands the “meaning of sorrow and pain” and, through the church, offers comfort to the afflicted just as it did for Sts. Francisco and Jacinta in their final moments. “That is the church’s ministry: the church asks the Lord to comfort the afflicted like yourselves, and he comforts you, even in ways you cannot see. He comforts you in the depths of your hearts and he comforts you with the gift of strength,” the pope said. The “hidden Jesus” the young shepherds adored in the Eucharist is also present “in the wounds of our brothers and sisters” where Christians can adore, seek and recognize Christ. “Do not be ashamed of being a precious treasure of the church,” he said.